This report is a representation of data and analysis on Document Management System from an actual market research. Due to confidentiality, and the proprietary interests of the company for which this research report is prepared this report has been modified and in some cases entire sections are heavily edited or not available. The target market and specific companies analyzed in this report have not been changed (the client’s name has been changed) so that we can best illustrate our clients about how we meet their specific requirements through with the help of this market research report on Document Management System. take now to prepare for this revolution in information management. that are making DMS possible, the application areas in which business value are being realized, and the market share till now and then, that will be involved in developing DMS. It also gives a glimpse to begin preparing for this major advancement in information management.The use of the term DMS in this document encompasses the scope and definition of DMS that can be defined as follows. comprehension, represented by a variety of symbols, stored and handled as a unit. ● System: ​the use of modern information technologies. 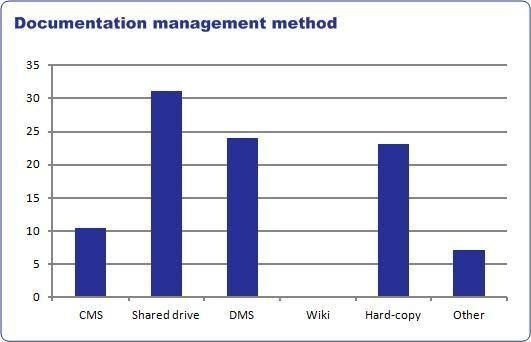 departments that have had primary responsibility for one or more functions in document management. It is these “document support” departments that will find this document especially important for accommodating the document processing needs of all other departments in the organization. The primary document support departments are: Law Firms/ Legal industry, Banking & Finance sector, Healthcare, Manufacturing, Education Systems, Pharmaceutical companies. Of all the pages that get handled each day in the average office, 90% are merely shuffled. $220 in labour to reproduce a lost document. 5% of all documents get lost, 3% of the remainder get misfiled. There are over 4 trillion paper documents in the U.S. alone – growing at a rate of 22% per year. Often, the biggest opportunities for cost savings are right under your nose. Did you know that recent research from IDC concluded that Fortune 500 companies as a whole lose an average of $12 Billion per year to inefficiencies caused by the lack of a structure for managing their documents and digital assets? 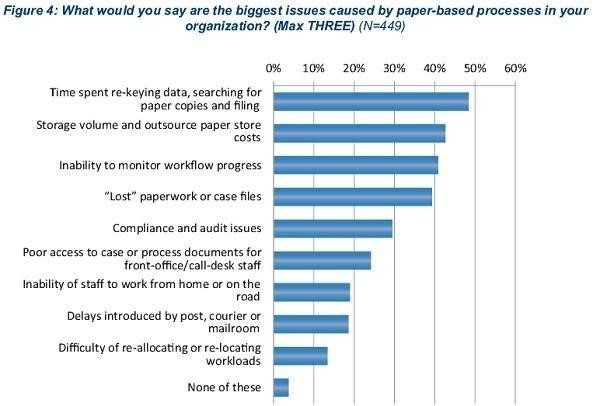 These statistics easily support the fact that most businesses will benefit from a well-deployed document management system. It is not an issue of “if” but “when”. From Accounting and Human Resources to Product Development and Customer Service, every department can realize productivity improvements. The sooner a document management solution is in place, the sooner the benefits can begin to affect business bottom-line and become the basis for efficiently conducting every business function. According to the Department of Health and Human Services’ Office of Civil Rights website, over the last 12 months 258 breaches have been reported. 71 of those were paper or film-based records. Compare that to just 16 electronic records. Of the two, paper is the clear loser when it comes to privacy and security. ​The growing need for data management across multiple platforms due to the substantial growth of e-commerce and social media. Need for Increased Efficiency and for a full, detailed list, view our report. Increased adoption of SaaS-based solutions. Microsoft has just announced a deal with NetDocuments that effectively kills off Microsoft SharePoint as a stand-alone DMS for the legal market. As part of the deal, cloud-based document and email management (DMS) provider NetDocuments announced that it will fully integrate its services with Microsoft cloud technologies, helping to transform law firm and legal department productivity in the cloud. The major industries that use DMS solutions the most are banking, financial services, insurance, retail, transportation & logistics, government & defence, life sciences & healthcare and energy & utility organizations. the forecast period from 2010 to 2020, while other emerging countries such as Brazil, Russia, China, India, and South Africa (BRICS) are also expected to experience a growth in the implementation of DMS solutions. The ECM market registered double-digit growth from 2004 to 2007, but its expansion slowed to a single-digit rate in 2008, primarily due to the deteriorating global economic conditions. According to Gartner’s statistics, worldwide ECM software license and maintenance revenue came to $3.3 billion in 2008. 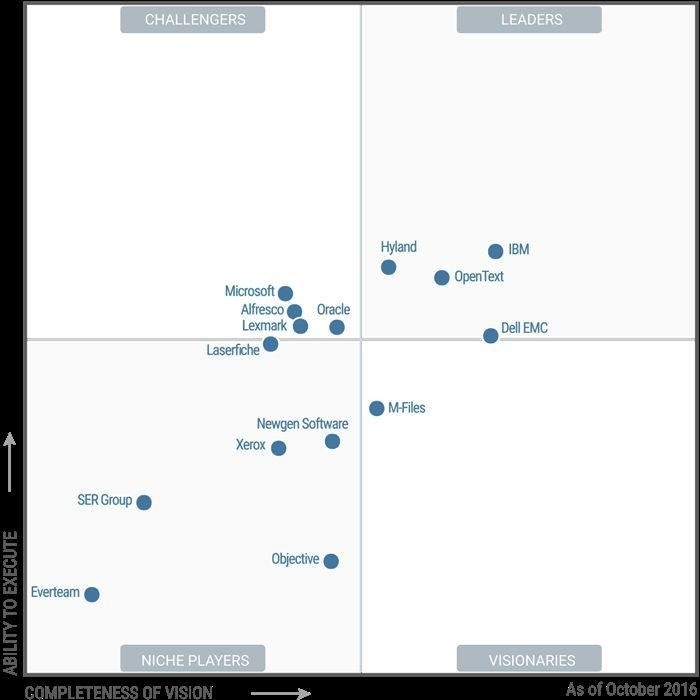 Gartner’s forecasted that total software revenue in the ECM(DMS) market will grow at a compound annual rate of 9.5% through 2013. The market’s return to stronger growth was expected to start in 2010, with rates climbing to double digits and worldwide ECM software revenue exceeding $5.1 billion by 2013. This represented a healthy market, but it was also one that is undergoing transformation. The DMS market grew 1.4% in 2015 to a worldwide size of $5.4 billion. 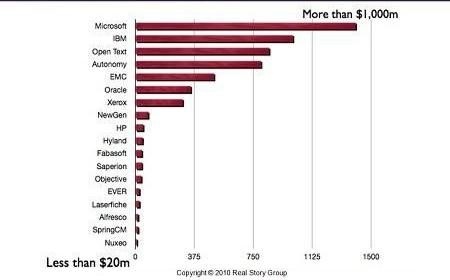 The combined share of IBM, OpenText and EMC dropped more than 6 points from 43.7% in 2013 to 37.6% in 2015. The DMS market size is estimated to grow from USD 28.10 billion in 2016 to USD 66.27 billion by 2021, at a Compound Annual Growth Rate (CAGR) of 18.7% due to exponential data growth, increasing need to manage data in enterprises, high need for securing confidential data and protection against data loss.